Congratulations to the Baseball Hall of Fame’s latest inductees! Jeff Bagwell, Tim Raines, and Ivan Rodriguez. I let other guys handle the talking. I love playing. We’ve all had a similar experience at some point. Or is that just me? With just one pitch, Ken Ash of the Cincinnati Reds was credited with not only a full inning of work, but also with the 6-5 victory over the Cubs on July 27, 1930. Entering the game in relief of Larry Benton, Ash managed to induce a triple play ball from the Cubs’ Charlie Grimm at Redland Field. Ash was then pulled for a pinch hitter in the bottom of the inning, when Cincinnati took the lead for good. 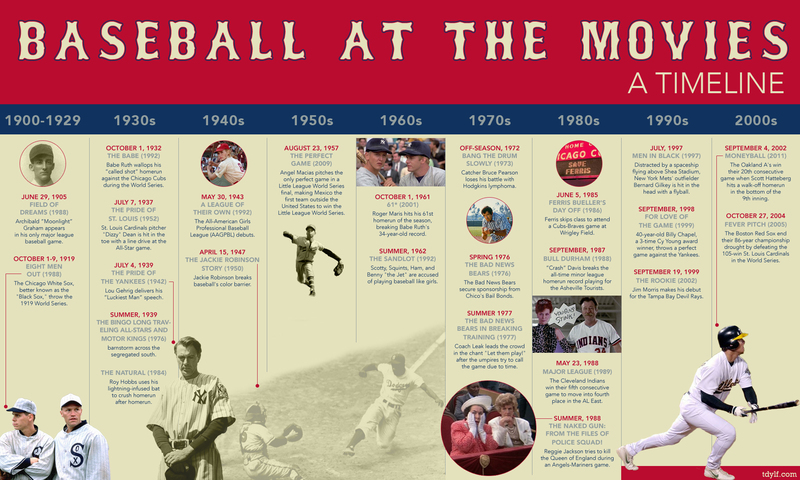 If you decide you want to watch your view through the different eras of baseball via the movies, here’s a handy guide to help you out. The image is a bit small here, but you can click on it for a bigger look. Given the title of this song, one would think there would be more than just a passing reference to baseball. Even though this tune isn’t necessarily about the game itself, it does provide a great example of baseball as a metaphor for life.